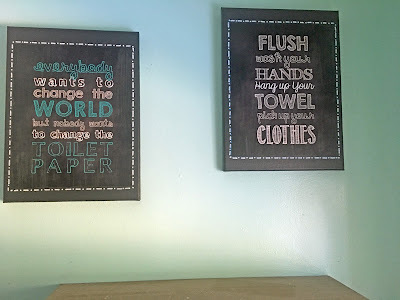 Controlling My Chaos: Farmhouse Love Episode 9 . . . The Bathroom is Finally Finished! Farmhouse Love Episode 9 . . . The Bathroom is Finally Finished! I thought I would never see this day. 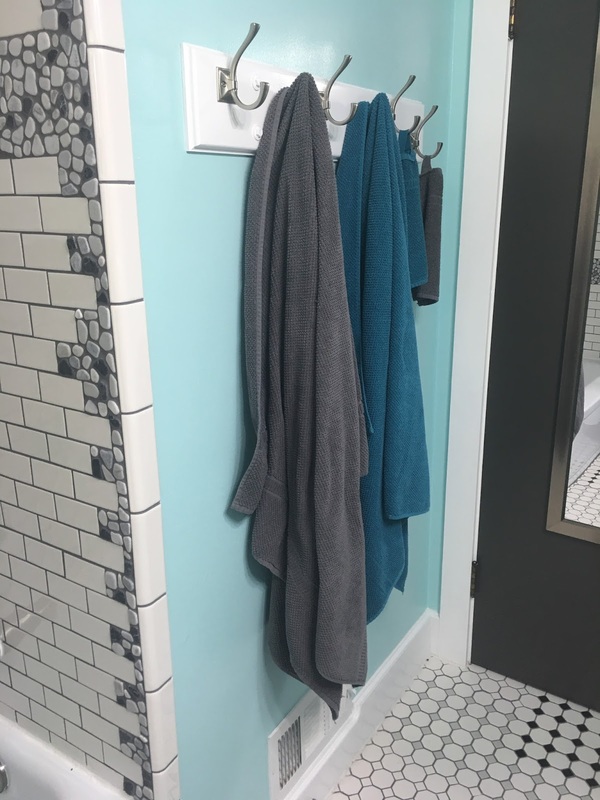 We started on this bathroom a year ago in September, and it was finished thirteen months later. This is the reality of a typical household in which people are expected to hold down jobs while they DIY on the side. It's such a buzz kill. Before I show you any more of the after, let's first take a trip down memory lane, to what was when we moved in. When we bought this house, the bathroom was painted this tan color with a pinkish tint. Everything was in need of replacing. The floor was bare plywood with a piece of carpet cut to fit the room. I've never been a fan of carpet in bathrooms anyway, but this carpet had seen better days. Or maybe not. It was nasty. 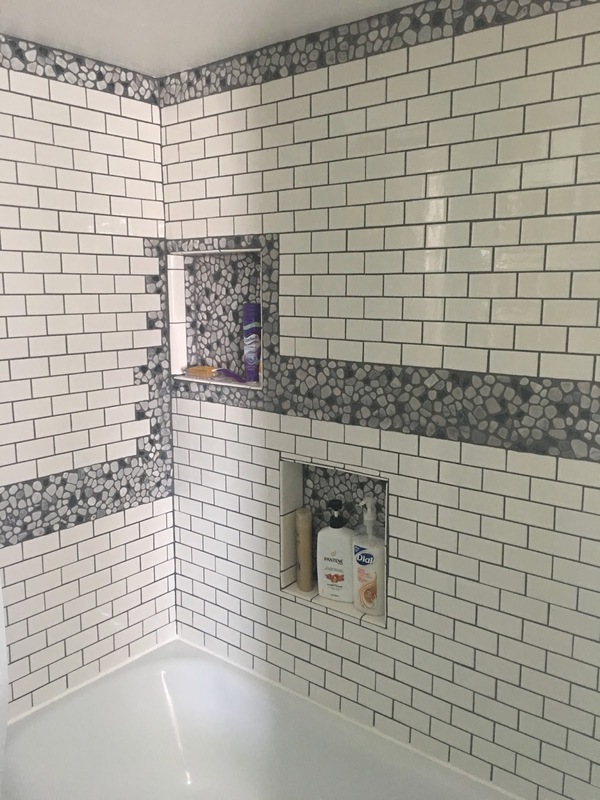 The tile was poorly installed, as you can see from the buckling at the base of the tub. There were holes throughout the grout as well. To be honest there was so much wrong with this bathroom that I won't even bother to point all of it out, lest you catch my #moneypit hives. The first step was to pull everything out and start demo on the tile. Our dirty little secret is that for awhile we had a white trash junk pile behind the barn, where the bathroom vanity and the toilet sat. And they were not lonely. We have made many trips to the landfill, and I'm happy to say that we now appear to be respectable property owners. Next Peanut Head laid down cement board for the tile. And then I came in and laid the tile. It only took me six or eight weeks. Who's counting? I am not a professional. I watch You Tube videos, obsess, and blunder on. I can't tell you how many sections I had to pull up and fix because I am not a professional. I am pretty proud of that detail work around the tub though. I wouldn't have wanted to do this job without a tile saw. The next, and probably most satisfying step, was paint. I love paint. It makes everything new again. The day Peanut Head installed the toilet was a beautiful day. Angels sang. I have a piece of advice where toilets are concerned. Don't buy the cheap one. We didn't buy the fancy pants toilet, but we picked one somewhere in the middle of the price range, and it works beautifully. I don't even think we need to keep a plunger in this bathroom, that's how good it works. And that's all I'm going to say about that because poop is not a polite topic of conversation. Once the toilet was in, we got quite a bit done relatively quickly, because by this time Thanksgiving was fast approaching and my sister-in-law was coming to visit. 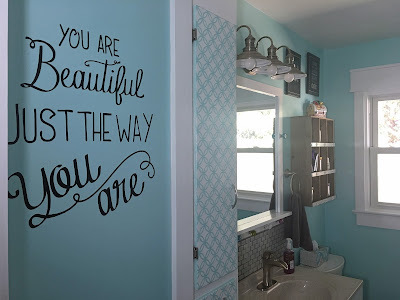 We had been living with only one bathroom for the four of us, and we knew we needed at least an additional partial bathroom to be functional for guests at Thanksgiving dinner. I'm talking about Thanksgiving 2016, not this year. Peanut Head framed this mirror to go with the window trim we knew we were going to add to the window. He also installed the farmhouse light fixture. It's operating room bright in here now, and I love it. We have to turn it on with a pull string because of the way the existing wiring was set up. Our choices for a vanity were very limited due to the size of the bathroom and the location and orientation of the plumbing. You truly do not appreciate how tiny this bathroom really is until you take a shower in it. I can't even imagine what it was like for the original owners with this being the only bathroom in the house for an entire family. Where did they even put all the towels? I had fun with my stencils on the built in drawers and cupboard. This doesn't look like a lot of storage, but it really holds a lot more than you might think. This house has charm and storage for miles. I love it. I painted the door because it was a hot mess, and we replaced the knob with a lever. There is no trim on the door in this picture, but that changes later as Peanut Head transitions everything to farmhouse trim. And this is how the bathroom remained until February or so. The tub surround was an intimidating project, and neither one of us was excited to tackle it. It was super slow going because Peanut Head had to cut the wall out in sections with his metal grinder. The plaster walls have a metal mesh holding the plaster together, so that's why he had to use a metal grinder. Both of us had to wear masks and I held the shop vac up next to the blade while he cut, in order to try to catch the mushroom cloud of dust. Every weekend we would cut another section out and fill our trash can up. Finally, we got it all out and just had some pesky asbestos insulation to deal with. Once that was replaced, demo was done and we could start making some progress again. By now it was March and we were in the current year. The next problem to deal with was the plumbing. Originally this house did not have a shower. 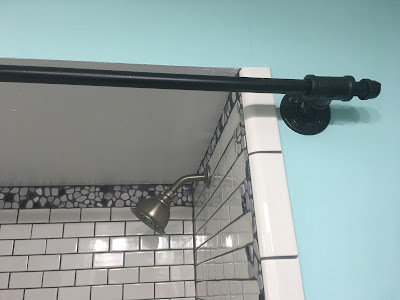 At one point a shower spray hose was attached to the tub spout. We wanted to go with a traditional shower head because we have teenagers. You have to think like a teenager and plan for mischief and mayhem. It's a rule. Ta-Da! Peanut Head is a magician. Next he built in some shower niches. 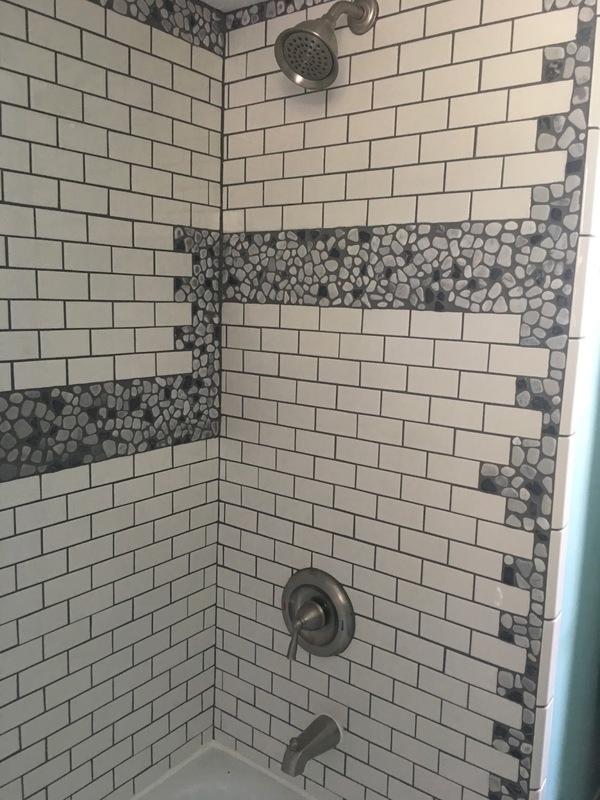 I was so excited about these, but when it came to tiling them, I had the stress sweats. I'm so glad it's done now. Somewhere along the way, probably May, although I can't find the pictures, Peanut Head put up the Hardi-Backer for me to adhere my tile to. Then I procrastinated because I was afraid to fail. I put off tiling until July. Meanwhile Peanut Head kept doing little things, like installing the new outlet and light switch with built in night lights. And we tackled the trim work around the window, door, baseboards, etc. 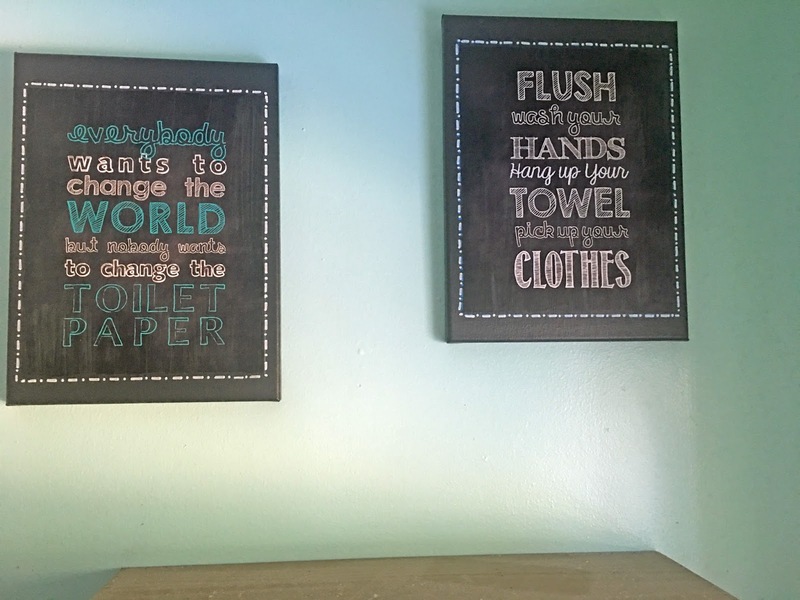 And I couldn't resist putting up some vinyl to remind my girls that even when they have bedhead and don't do their chores as fast as I think they should, I think they're beautiful. In my final push towards procrastination, I tiled the backsplash of the sink. For some reason I don't have a picture straight on with the grout in. I used a dark, pewter color grout, and I wish I would have used a white grout instead. I think it would look better with these glass tiles. I don't care enough to dig it all out and redo it though, so we're living with it. Finally I forced myself to tackle the tiling. I started with the niches, because in my mind they would be easy. Famous last words. I also marked out my level lines for the subway tile and marked the center points to start from on each wall. My plan was to tile in stages in order to avoid slippage, because gravity is real. 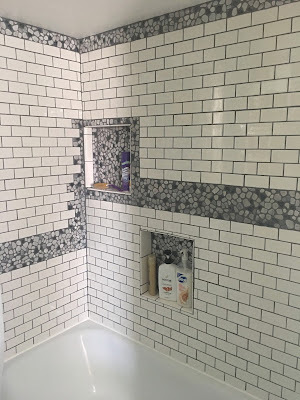 Not only did the former tiled wall have slippage at the base, but it was also adhered directly to the plaster wall, without a cement board base. That's a big no no because the cement board provides a stable moisture barrier. Without it, the metal mesh in the plaster walls rusted and the wall had rot from moisture seeping through the old grout. Once I got to this height I kept changing my mind about how and where to install the river rock. The original plan was to have a neat, linear six-inch border of river rock around the whole tub surround. Then as I got to the edges of each wall I couldn't get the picture of a comic book brick wall with subway tile peeking through it out of my head. Or maybe it's a subway tile wall with brick peeking through it? I don't know. Just think of Clark Kent ripping open his collared shirt to reveal his Superman get up. That's the inspiration. I had to make multiple trips to Home Depot for more river rock. I don't even want to know how much I spent on the inspiration. The irony is that our property is basically a rock quarry with a house and some outbuildings on it. Every time Peanut Head checked on my progress he did a little head tilt, trying to figure out where I was going with this. I heard a lot of tongue biting whilst he was following my progress. I would exclaim "I don't know, but this is fun! I just keep getting new ideas!" I'm pretty sure Bob Vila would be horrified with my process. In this picture and the one below, the tile is finished but not yet grouted. My plans for the finished edges kept changing as well, so the finished product was a surprise to me too. 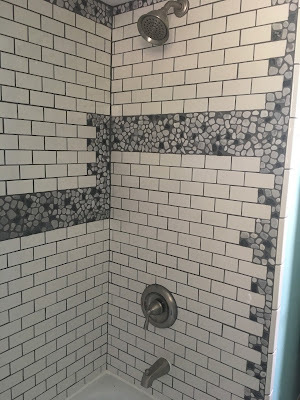 Grout makes everything look better. Then Peanut Head came in and installed the plumbing. That was not meant as a commentary on his skills. He's really very handy. It's just that this place is a bit of a #moneypit and it wouldn't surprise us to get to this point and find another surprise, even though he checked that the plumbing worked before installation of all this Crazy Town. Not only do we refer to this house, lovingly, as The Money Pit, but we are constantly chanting "If you give a mouse a cookie . . ." because if we do this, we have to do that. And if we do that, well then we might as well . . . blah, blah, blah. Oh look, here's a shot where you can see the grout on the sink backsplash. Squint a little and you'll see it. 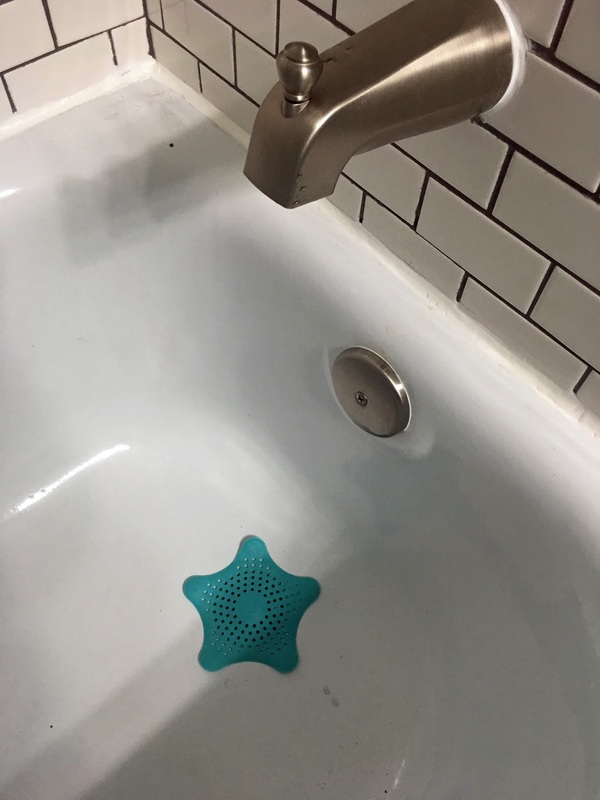 The tub has an unusually large drain, so we have this starfish thingy in order to keep kittens from falling to their deaths. And wads of hair from teenagers, I suppose. Although I'm constantly admonishing the girls to "Wipe that nasty wad of hair off the starfish, for the love of Peter Pan!" We obsessed over the shower curtain rod, and eventually we came up with the idea of repeating the curtain hardware from the girls' bedrooms. 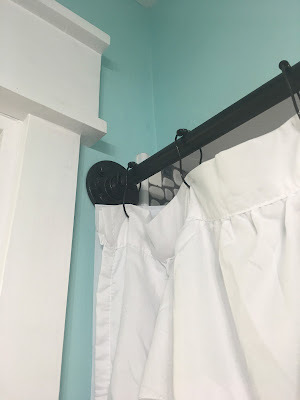 After having used this set up for a couple months, I'm seeing little black specks of paint on the window sill from the curtain rings sliding across the rod. I don't know if this will stand the test of time, but I'm crossing my fingers. I think the bigger problem could be rust, which is why we painted the plumbing pipe and fittings to begin with. It's possible that the paint is flaking off the rings and not the pipe. This is me not wanting to make one more trip into town to find dark shower curtain rings. My next problem was where to hang the bath poufs. 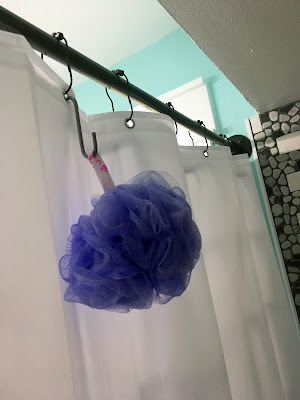 I was planning on hanging them from suction cup hooks on the shower wall, but nothing sticks to the tile. Argh! Finally I remembered about these leftover hooks I had from Ikea, and it was the perfect solution. 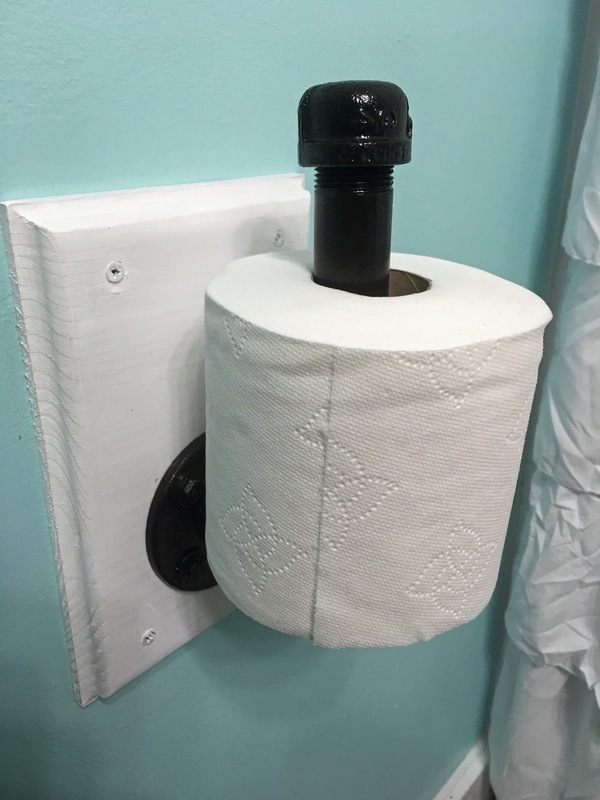 I love this toilet paper holder that Peanut Head made. The previous toilet paper holder was the type that sits inside the wall and has a spring rod thingy. 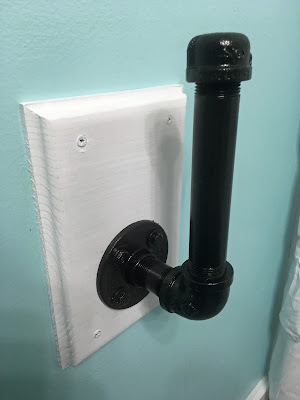 We didn't want to patch the wall from the hole it left, so Peanut Head just made this wood piece, routed to match the baseboard, and fastened the plumbing pipe and fittings to the board. And it's super easy to change! Although I still need this sign about changing the toilet paper because still, my spawn stack the new roll on top of the empty roll. Why. Do. People. Do. That? I think they do these things on purpose because they know it makes me crazy. 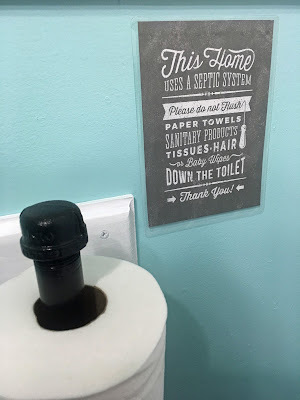 I have this little sign in both of my bathrooms because I'm super paranoid about septic problems. I've heard horror stories, and one thing an OCD person never wants to see in their house is sewage. Although I'm pretty sure nobody want to see that, but OCD people obsess about nightmares like that. Peanut Head made the towel hanger too. 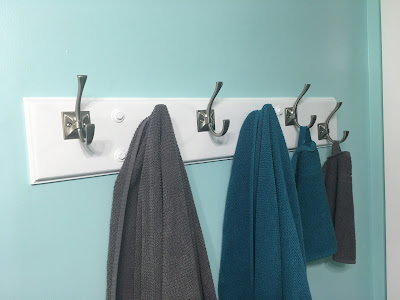 I like hooks because you can hang more towels and you don't have to fret about making them look tidy. They hang conveniently over the heater vent because honestly, that's the only spot we could have put it. This bathroom is teeny tiny. Do you like how Peanut Head adapted his baseboard to go around the vent? He did the same thing on the baseboard he made for the girls' rooms. 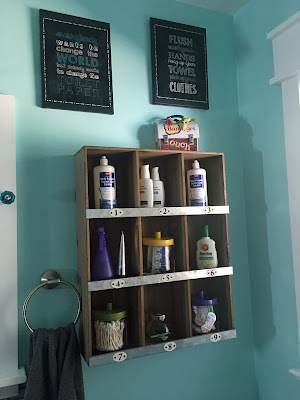 I had this same Target unit in the bathroom of our last house, and I had to have it for this bathroom too. 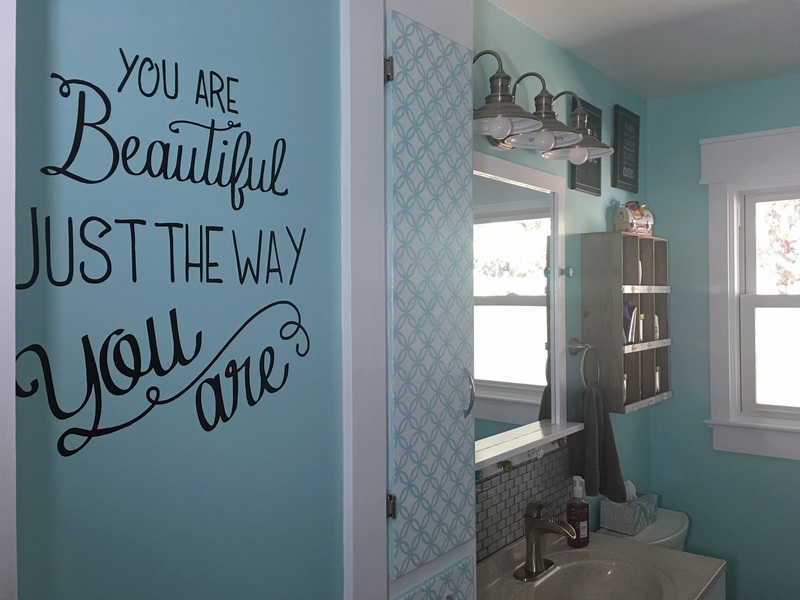 I knew as soon as we put an offer on this house that it needed to be in this bathroom, so it was the first thing I bought before we even moved in. 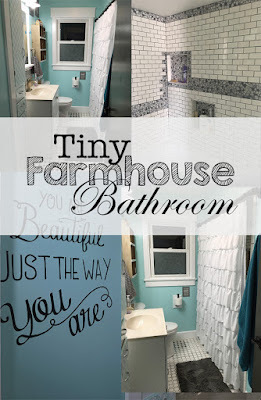 Here's a shot of the whole bathroom with the new farm house trim on the window. The shower curtain is from Bed, Bath, and Beyond online. 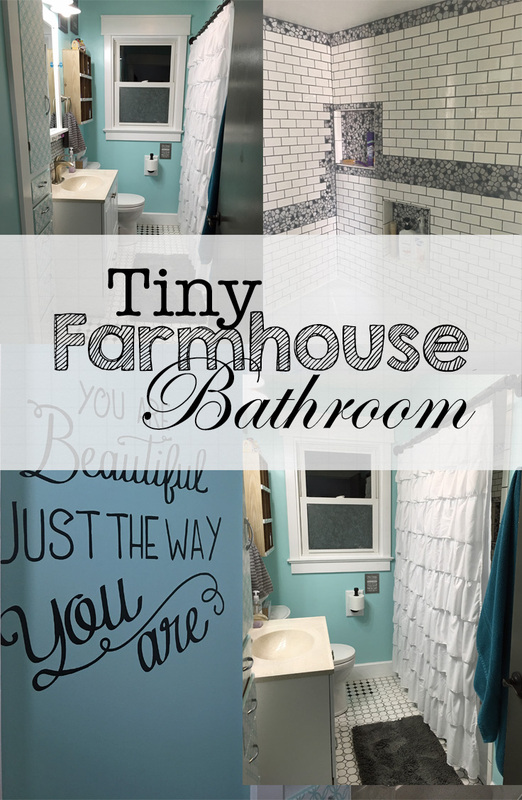 And that, My Friends, was the thirteen month transformation of our teeny tiny farmhouse bathroom. Although to be honest, it's really not done yet because I still need to make a little cafe curtain for the window, and Peanut Head has to install a ventilation fan. I told him we should just hire it out, be he's channeling his Depression Era dad and refuses. For now, we both choose denial. As we scream at the girls to shower with the ding dang door open. Because we're fancy like that. And here's my Pinterest worthy pin picture. Because Pinterest is where all my traffic comes from, and nobody reads blogs anymore. They're so yesterday. That's me, always a decade behind the rest of the world. I read your blog!!! Love the bathroom! !